Thanks to Target web listings once again, we have a heads up on 3 newly revealed items. The first, as you can see, is a Zombie Strike Magnus Pack. 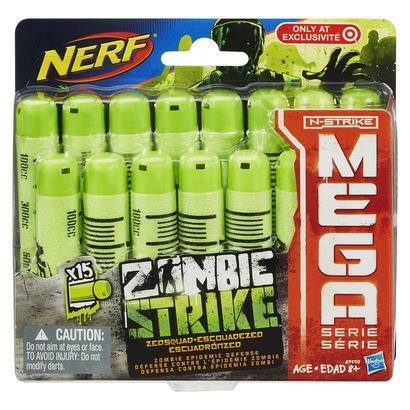 It retails for $29.99 at Target and features new Zombie Strike Mega Darts. Product descriptions and web listings for the items can be found in this post. Once again, this info is about the USA Target’s only, no clue when or if any other countries are getting this. The Magnus gets a slightly darker red repaint for one of the blasters, and a sort of dark turquoise for the other. Scroll down the post to see more info about the new Zombie Strike Mega Darts and the Elite Precision Target Set. Your battles against the zombies are about to get Mega bigger! Arm yourself and a friend with the 2 Magnus blasters in this pack. These big blasters fire bigger darts that are engineered to fire farther than ever! Pair up for a Mega strike at zombies up to 85 feet away and take them out one by one, or go it alone with one in each fist. Each blasters built-in, 1-handed clip lets you reload fast to get back in the game, and they come with 6 Mega Darts! 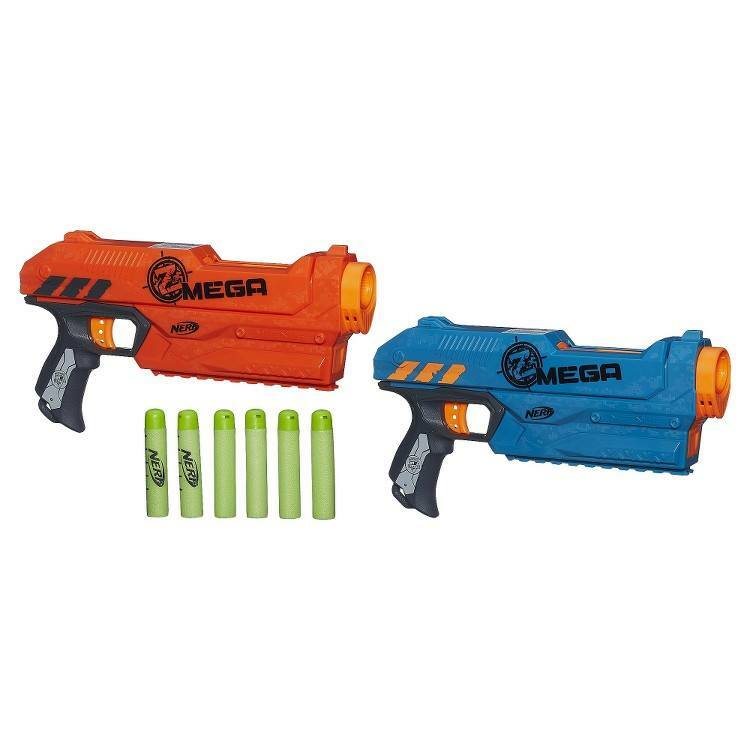 Hit the battlefield with Mega power with these 2 Magnus blasters!Nerf and all related characters are trademarks of Hasbro.Includes 2 Magnus blasters, 6 Mega Darts and instructions Magnus blaster 2-pack includes 2 blasters that fire Mega Darts farther than ever Fires Mega Darts up to 85 feet Includes 6 Mega Darts Top-loading clips let you reload fast one-handed Ages 8 and up. CAUTION: Do not aim at eyes or face. TO AVOID INJURY: Use only darts designed for this product. Do not modify darts or dart blaster. Magnus blaster works with Mega Darts only. Item can be gift wrapped. If you’ll notice in the product description for these darts, the Mega Magnus Pack, and the Zombie Strike Longshot CS-12, their advertising something called “ZED Squad”, which I assume is a way to get kids and peopel to play with each other. These darts, as well as the ones shown in the Longshot CS-12 box art, feature syringe style darts which seems to be the cure for zombies. This retails for $9.99 on the Target site. The zombie threat is getting bigger every day, and you need bigger ammo to fight back! This ZED Squad Dart Refill has 15 Zombie Strike Mega Darts for mega distance. With this 15-pack of far-flying darts, you’ll have an edge on the battlefield. 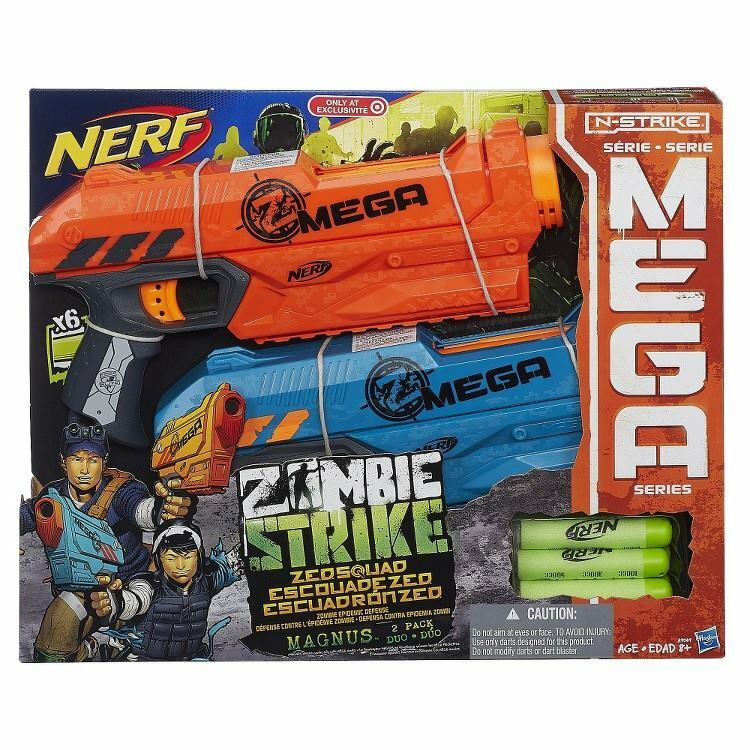 They work with Zombie Strike Magnus blasters and all Nerf Mega blasters. 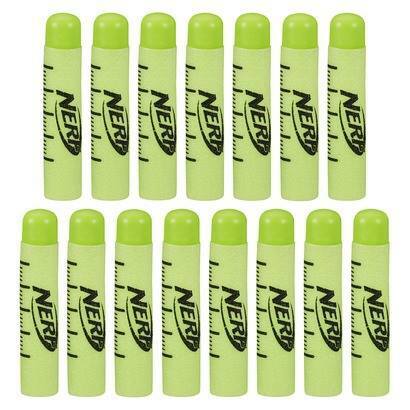 Ammo up with this 15-dart refill pack!Nerf and all related characters are trademarks of Hasbro. [PRODUCT INCLUDES LIST]Includes 15 darts. [PRODUCT FEATURES] Reload against the zombies with this 15-dart refill pack Pack includes 15 Zombie Strike Mega Darts Bigger darts for bigger battles Darts work with Zombie Strike Magnus blasters and all Nerf Mega blasters (sold separately)[PRODUCT BULLETS] Ages 8 and up. CAUTION: Do not aim at eyes or face. TO AVOID INJURY: Do not modify darts. And lastly, we have the new Elite Precision Target Set. It looks and seems to serve a similar function to the Rebelle Star Shot that was released late last year/early this year. Looking at the darts, it seems that we won’t be getting Elite Darts. This retails for $19.99 on the Target site. Test your accuracy with the Precision Target Set! The set includes everything you need for target practice: a Firestrike blaster, a target, and 10 Suction Darts in 2 different colors. Just stand up the target or hang it from a door, and take aim with the light beam when it’s your turn. Your Suction Darts stick to the target, so you can see your accuracy improve with each shot! Sharpen your dart-blasting skills alone or take on a friend in a suction-dart showdown. 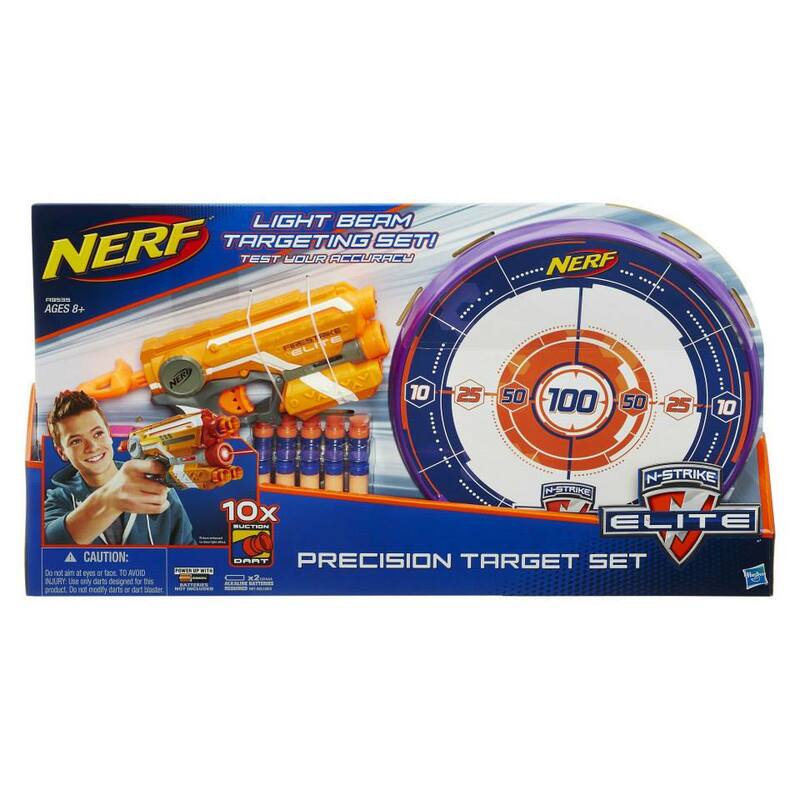 Either way, you’ll become a sharpshooter with the Precision Target Set!Nerf and all related characters are trademarks of Hasbro. 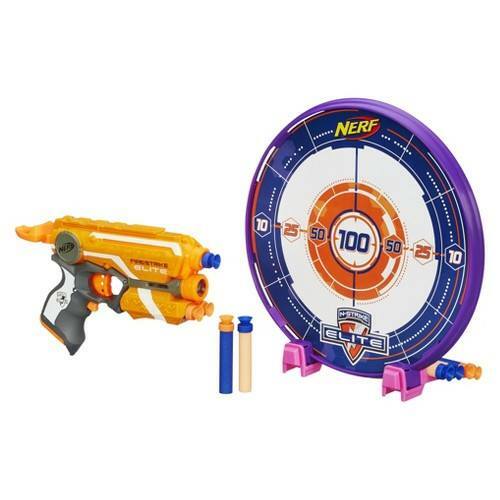 [PRODUCT INCLUDES LIST]Includes Firestrike blaster, target, 10 Suction Darts (2 colors), and instructions. [PRODUCT FEATURES] The Precision Target Set has everything you need for target practice or a competition Target can stand up or be hung on a door Blaster’s Light Beam Trigger activates the precision Light Beam, which works on targets up to 15 feet away 10 Suction Darts work with most front-loading N-Strike blasters (sold separately) Darts come in 2 colors so you can tell whose shot is whose[PRODUCT BULLETS] Ages 8 and up CAUTION: Do not aim at eyes or face. TO AVOID INJURY: Use only darts designed for this product. Do not modify darts or dart blaster. Requires 2 “AAA” batteries (not included). Suction Darts only work with front-loading blasters. Meh. Still not buying a Magnus, it’s to clunky.